Authors Note: All frameworks have moved to a new home at Strategy Umwelt. Please join me at this new platform for a revised list of mental models, strategy frameworks and principles including a revised version of the Project Management Triangle. In marketing and advertising, a mental model that gets referenced quite regularly is what's called the Project Management Triangle, or the "Iron Triangle". This is also one of the most polarising concepts I have seen, so remember to use it wisely. 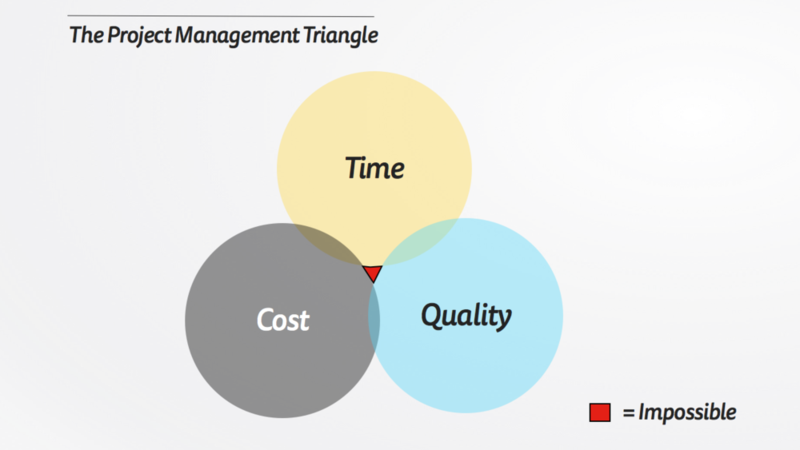 The Project Management Triangle is essentially a positive trilemma, where there are three favorable options, but only two can be achieved at the expense of the other. Traditionally, this was applied to the variables of Time, Cost and Scope. More recently however, scope is often interchanged with a sub variable; there is a tendency to utilize Quality, Product, Goals or Deliverables (with Quality utilized most often). You may have also seen the triangle represented as a Venn or Euler diagram, depending on how technical you want to get. So in the more modern variation, the model tends to express the dynamics of a project when applied to creative output. This leads to three scenarios. Firstly, if a marketer wants their creative completed fast, and at a high quality, the result is increased expense. The agency may need to add more people into the mix, utilise more senior staff, and potentially preference the work over other client requests. Second, if a marketer wants their creative fast, but cheap, the result needs to be an expectation of reduced quality. Less senior people will be involved, corners will be cut, and ideas may not be properly fleshed out. Lastly, if a marketer wants to retain quality, but have it done cheaply, the result is a much extended timeline. Other normal paid projects will need to be focused on by the agency - they are after all ultimately in the business of making money. The Project Management Triangle Scenarios. When using this model, be very careful - it should be applied to your thinking to help come up with solutions to problems and manage expectations, not create new ones. Most marketers I have talked to who have had a PM bring this up with them have found the experience extremely patronizing or passive aggressive (I have even heard stories of Junior PMs trying to draw this in front of million dollar business owners, not a smart move). There are also situations that could be argued fly against this, as in theory you should be able to maximize quality, cost and time. Say a process is set up the first time a task is undertaken - you should be able to produce it fast, and at the same quality, but for a cheaper cost next time it happens. Managing projects can be stressful. Where the PM Triangle can work best is reminding both marketers and advertisers that they are both suffering from similar pressures. Advertisers need to realize that marketers have their own complexity dealing with internal stakeholders, and use this model to help subtly highlight potential problems so solutions can be driven through. On the reverse, marketers need to remember that advertising agencies are themselves a business. They have their own pressures to be profitable and manage competing relationships, so there needs to be some give and take. Together this can hopefully lead to a better long term relationship. A revised version of this post is available at Strategy Umwelt.